It’s too bad the Florida State League can only hand out one award for Player of the Week because the entire Manatees outfield could have been honored for its performance over the last seven days. Michael Reed ultimately took the prize, but Victor Roache and Tyrone Taylor made the decision tougher than it should have been for the league’s front office. We’ll start with the winner. Reed seemingly reached base every time he stepped into the batter’s box this week. The ‘Tees right fielder compiled a .700 on base percentage (21-for-30) on the week with eight walks and one hit-by-pitch. Reed, however, was not solely a free-pass machine. The FSL Player of the Week was 12-for-27 at the plate (.571 AVG) and doubled his career home run total with a pair of long balls over a six-game span. Adding to his banner week, Reed registered four multi-hit games, legged out four doubles, stole three times out of five attempts, scored nine runs and drove in five. Just for good measure, the right fielder was nearly impossible to retire on strikes. Reed struck out just once in 30 plate appearances. 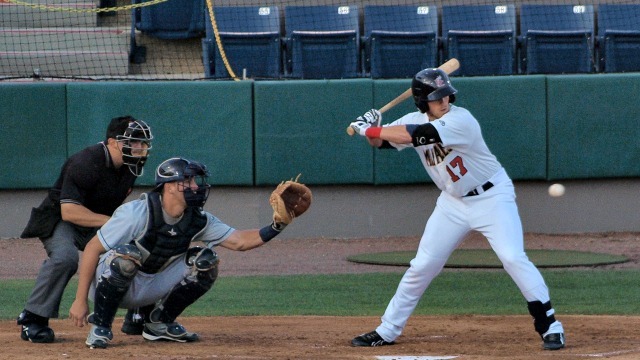 Michael Reed won FSL Player of the Week with a .571 batting average and two home runs. After the cycle, Taylor remained hot. The center fielder added to his stunning doubles total with four over a six-game stretch to give him a Minor League Baseball-best 14 on the season. In addition, Taylor hit a pair of home runs and tripled once. The center fielder hit for a .444 average on the week and only five of his 12 hits were singles. Roache’s power-driven Sunday was the highlight of a strong week for the left fielder. Roache drove home 10 runs and compiled four multi-RBI games. He also hit for a .375 average (9-for-24) with a double and a triple. The collective efforts of Reed, Taylor and Roache have helped the Manatees win five of their six games this week. Brevard’s other outfielders also performed well during that stretch. Jose Sermo scored the eventual game-winning run on Monday when he stole third and scampered home as the throw skipped into left field. Nathan Orf walked five times and was hit by a pitch to register a .421 on base percentage. Meanwhile, Major League rehabber Logan Schafer laced an RBI double in his second at-bat with the ‘Tees.